As the shelves in supermarkets expand with ever-more vitamin tablets and dietary supplements, it only follows suit that we should see an increase in the amount of supplements and minerals available for our pets as well. With many people claiming to love animals more than their human counterparts, it seems this wide selection of pet health-aids is only going to become more varied. In addition, it’s not just the traditional, larger animals such as dogs and cats and horses taking supplements – vitamins are now available for the smallest hamster with a discerning owner who wishes to keep their furry friend in tip-top condition. There is a simple reason why our domestic pets often outlive their wild counterparts – they have a better diet. Even so, the manufactured and highly-processed food we have to feed our animals is often lacking in a few essential minerals as the creation process brings about the natural decay in the efficiency of these vitamins and minerals. It is fortunate, then, that owners have access to the products that can supply those missing minerals to their animals, ensuring a long and healthy life. Owners hoping to prevent or lessen conditions such as aching joints in their pets should research their choices carefully. Your pet’s health is as important to you as your own, so ensure you talk to other owners and animal experts about what supplements are the best for keeping your dog, cat or guinea pig as healthy as it can be. Your vet will be able to advise you if your dog, cat, horse or hamster needs anything special in its diet, but by using supplements, you may be ensuring your precious pet gets everything it needs. Owners of picky parrots or fussy felines are thankful that modern science has turned a treat into something extremely beneficial for the health of their pet. However, it’s not just about keeping healthy on the inside – the pampered cat or show dog also needs to look good on the outside. Obviously covering your gorgeous dog’s face in wrinkle-cream isn’t going to help, so owners can choose to add to the healthy, varied diet of their pets by adding tasty treats that also supplement their pet’s intake of vitamins and minerals. Vitamin E tablets and treats are popular to ensure a shiny coat, and peppermint and parsley make up the equivalent of a doggy breath-mint. 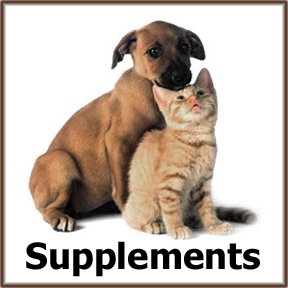 Supplements take the worry out of feeding your pets a healthy diet – with the right combination of vitamins, minerals and oils, your pet will be getting everything it needs to be a happy and satisfied companion.